Well it’s Week 2 of the One Room Challenge where we’re transforming one room in our house over the next 6 weeks along with the 20 chosen design bloggers as well as the 96 other bloggers playing along in the linkup rounds over at Calling It Home. In Week 1, we started things off by revealing our plans for what we’re calling #OperationOrganizedEntryway (if you missed it you can go get caught up here). We’ve been pretty busy over the last week, despite the fact that if you were to open our front door right now you wouldn’t be able to tell. If you’re a regular follower of our blog, you know that Operation Organized Entryway isn’t the only project we have on the go right now. We’re down to the wire trying to get the entire house completed and with the cold weather rolling in fast we’ve had to play a little double duty getting our stone up on the exterior of the house while the temperatures permit. Sort of. Technically The actual “prepping” part hasn’t happened yet. That’s this evening’s mission, but it feels better to have the first thing checked off this massive list (even if it’s only half true, lol!) We were however able to track down a local supplier that got us a roll of Schluter Ditra XL at a great price! We opted for the Ditra XL for a few reasons. 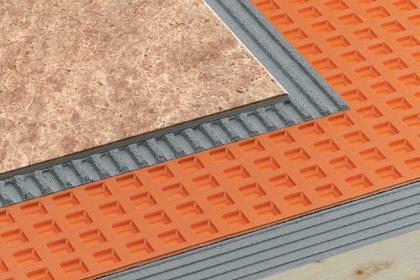 First, from everything we’ve researched, it’s the best product on the market as far as tile underlayment goes. It offers the benefits of a waterproofing layer, an uncoupling membrane which keeps your tiles & grout from cracking, but best of all the thicker 5/16″ profile of the XL will make for a nice even transition to our 3/4″ hardwood floors that will be going into the living area adjacent to the entryway. How awesome is that?! We decided to use the PAX system to achieve the look we want for our built in closets so we made a trip to IKEA this week to pick up the items we’ll need. (If you follow us on Instagram you might have seen a few of the other things that sidetracked us from our mission, lol). Here, however is what we did pick up. We got this in a slightly different configuration. We’ll have 5 wardrobe system, with 4 white doors & 2 turquoise doors (one of which will be a false door to cover our duct work). We’re thinking it might be fun to do something bold with paint to go along with the doors! Our system will also have shelves & clothes rails at varying heights so that they’ll be reachable by Kes & I as well as our little guy. These are going to be awsome for holding all our hats, scarves, gloves, etc..
As for the rest of the list…. Hang wall hooks & accessories. Those are all still yet to be accomplished. So there you have it. It’s not a whole lot of prorgress, but it’s a start. We have a lot of work ahead but we’re getting excited to see it all come together! What do you think? Is the lack of progress after the first week an indication that we might have bitten off more than we can chew? Or is it just a case of slow & wins the race? And don’t forget to head over to Calling it Home and check out some of the progress the other amazing bloggers have made, then check back in with us next Thursday for more on #OperationOrganizedEntryway! We’ll also be posting some behind the scenes pics on instragram and facebook so be sure to follow us during the week there as well! Ohhhhh boy this entryway is going to be amazing. I can feel it! Can’t wait to see more of it, you guys! Thanks Thalita! Beginning to feel the pressure, but we’re getting there. 🙂 Loving the progress on your master bedroom, btw! Wow! Wow! It’s going to look beautiful! I love the stone you’re adding! Can’t wait to see more! (If you have a minute, I’d love to invite you to our link up party on the blog please!) Have a great weekend! You just do your best. That’s all anyone could expect. Hang in there. Those floors sounded very technical. Good luck. Thanks Linda! The floor underlayment really isn’t as technical as it sounds. 🙂 I’m hanging in there. I really am enjoying having the goal of posting progress each week. I find that it’s so easy to get so caught up in doing the work that you forget you wanted to document it. Having a blog goal definitely helps. Thanks for hosting the ORC! I’m a firm believer in slow and steady wins the race. Hope it’s true – I’m in the same boat as you – progress is SLOW on my room too. Here’s hoping we’re both successful!